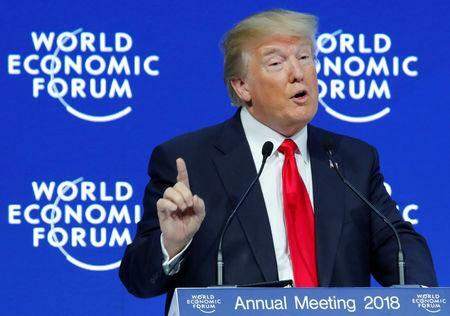 WASHINGTON (Reuters) - The U.S. economy sits atop of the World Economic Forum's annual global competitiveness survey for the first time since the 2007-2009 financial crisis, benefiting from a new ranking methodology this year, the Swiss body said on Tuesday. In its closely-watched annual Global Competitiveness Report, the WEF said the U.S. is the country closest to the "frontier of competitiveness," an indicator that ranks competitive productivity using a scale from zero to 100. The U.S. beat off Singapore, Germany, Switzerland and Japan, the other top four markets, with a score of 85.6 out of 100, the report said, due to its "vibrant" entrepreneurial culture and "strong" labour market and financial system. The World Economic Forum, the same organisation that runs the Davos meeting of global powerbrokers each January, bases its rankings of 140 economies on a dozen drivers of competitiveness, including a country's institutions and the policies that help drive productivity. This year the WEF changed its methodology to better account for future readiness for competition, such as a country's idea generation, entrepreneurial culture, and the number of businesses that disrupt existing markets. The WEF said it was too early to factor in how the Trump administration's recent trade policies would affect its ranking. "While it is too early for the data to filter through in this year's report, we would expect trade tensions with China and other trading partners to have a negative impact on the US’ competitiveness in the future, were they to continue," Saadia Zahidi, the managing director at the World Economic Forum, said in an email. "Open economies are more competitive."